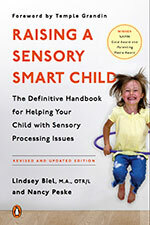 Updated and Expanded Edition of Raising a Sensory Smart Child Brand New 3rd edition! Raising A Sensory Smart Child is the award-winning, definitive handbook for dealing with sensory processing challenges, providing you with invaluable insights, practical tips, real-life strategies and resources−whether you are helping a baby, young child, teenager, adult child or yourself. Information on interoception, the sensory system that relays information about our bodies’ internal condition including hunger, thirst, heart rate, and respiration. Complementary therapies, resources, helpful websites and much more! In all, the new edition of Raising a Sensory Smart Child is the single most important book for anyone who parents, teaches, works with, or simply cares about a child with sensory issues. Lindsey Biel, M.A., OTR/L (left) is an occupational therapist based in New York City, where she evaluates and treats children, adolescents, and young adults with sensory processing issues, developmental delays, autism, physical disabilities, and other challenges. Lindsey specializes in building fine and gross motor, visual processing, self-help, and sensory processing skills to promote optimal engagement and independence. She also helps families, schools, museums, libraries and other community facilities with simple modifications and accommodations to enhance a person’s ability to learn, play, and thrive. Lindsey received her training at New York University and has worked in both the New York City of Department of Education and the New York State Early Intervention system.She is also the author of Sensory Processing Challenges: Effective Clinical Work with Kids & Teens published by W.W. Norton Mental Health. She has written numerous articles and book chapters for professional and parenting publications, has been featured on multiple podcasts and radio talk shows, and is the co-creator of the Sensory Processing Master Class DVD program with Drs. Brock and Fernette Eide. She conducts workshops for school staff, parents, and professionals across the country. 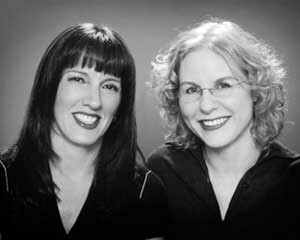 Nancy Peske (right) is a freelance writer, editor, and book publishing consultant, and the co-author of the Cinematherapy series. She does presentations on sensory smart parenting and lives in Milwaukee, Wisconsin with her husband and son, who has sensory processing issues. Dr. Temple Grandin, who wrote the foreword, is Associate Professor of Animal Science at Colorado State University and is a person with autism. She is the author of numerous books including Thinking in Pictures and other bestselling books. You can find out more about Dr. Grandin on her website. Chapter 1: Why Is My Child So… Unusual? Chapter 4: Where Did the Wires Cross?